NEW ORLEANS – It’s obvious that Adams State has dominated the cross country scene in NCAA Division II for quite some time. The women’s program has won two of the last three national titles, while the men have collected five across the last six years. However, they are as good in the classroom as they are on the course. 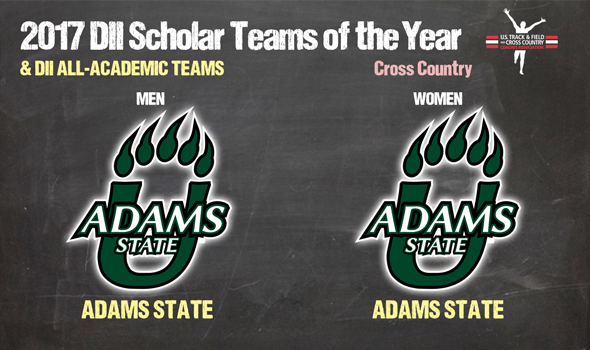 The Grizzlies swept the Male and Female Scholar Teams of the Year for the 2017 cross country season, announced the U.S. Track & Field and Cross Country Coaches Association (USTFCCCA) on Thursday. They become the first program to win both awards in the same cross country season since Western State did so back in 2011. This isn’t a first for Adams State, though. The women’s program has garnered six Female Scholar Team of the Year honors since 2006, while the men’s team is picking up its seventh, and second in a row. Damon Martin’s teams earned these honors by being the highest-finishing team from their gender at the NCAA Division II Cross Country Championships to have garnered All-Academic honors. Teams must have compiled a cumulative grade point average of at least 3.0 and must have scored at an NCAA Division II regional meet to qualify for All-Academic team awards. Both Adams State teams took home first-place trophies to Alamosa, Colorado, this past November. The men’s program won its second-straight cross country championship with 44 points at the University of Southern Indiana. All five scorers finished in the top-16, including three runners who notched top-10 finishes. In the classroom, the Grizzly men put together a team grade point average of 3.1. The Adams State snuck by U-Mary for the national title by a score of 126-137. The Grizzlies saw three of its runners finish in the top-20. The women Grizzlies recorded a 3.26 grade point average. Overall, there were 176 teams – 157 women’s teams and 119 men’s teams – that picked up All-Academic honors. Union (Tenn.) paced the women’s side with the highest team grade point average of 3.92. Alderson Broaddus and Azusa Pacific tied for the best men’s grand point average, as each program posted a 3.77 in the classroom. The full list of teams honored by the USTFCCCA can be found below.